With its very own play area, The Barn is our largest property and perfect for groups or larger families. It is a spacious, five bedroomed house which has been converted from two cottages into one. 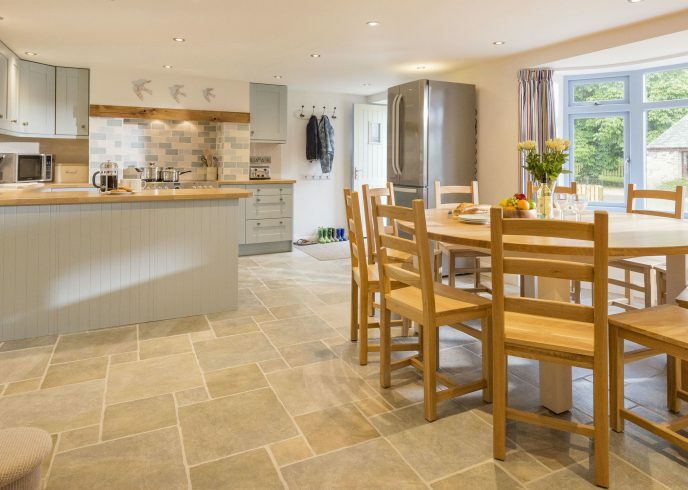 With slate flooring and underfloor heating, the open plan kitchen and dining room is a large, comfortable space with seating for 10 people at the dining table. There is an electric range cooker and an American-style fridge freezer. Downstairs there are two double en-suite bedrooms. Upstairs there are three bedrooms; one twin en-suite, one bunk room and one large double room. There is also a large family bathroom with a bath and a shower. The lounge boasts a 42 inch flat screen television with Freeview and a DVD player, a cottage iPad and its own WiFi. The log burner is lovely on chilly evenings. The fully-enclosed garden features a barbecue and garden furniture. In the shed you’ll find a washing machine and tumble drier, and there is an external hosepipe for washing wetsuits. The house has its own parking spaces at the front. We do not accept dogs in this cottage.